“Witty, smart, detailed, and highly entertaining. Dave Wakeland isn't the usual PI. A 29-year-old ex-cop, he makes a habit of bad ideas. Chelsea Loam falls squarely into that category. Chelsea disappeared eleven years ago, leaving a trail leading towards career criminals and powerful men. Taking her case quickly starts to look like a good way to get killed. The Vancouver Sun/ PostMedia - Brett Grubisic - "Sharp, Terrific, Disturbingly Grim"
Dead End Follies - Benoit Lelievre - The PI novel may have found "its new generation flagship author." Hazlitt - Naben Ruthnum - "accomplishes what Richard Price's novels and David Simon's television shows do." Globe and Mail - Margaret Cannon - "Haven't yet heard of Sam Wiebe? You will soon." Toronto Star - "A story as appealing as it is mysterious." Booklist - Don Crinklaw - "Wiebe illustrates the law of the jungle here, and he does it with great narrative skill and some very cool dialogue." Mac's Backs - "The writing is crisp and pleasing. The plot is engrossing, with a nice array of suspects and red herrings. Vancouver is well-described, giving the book a sense of place and making the city almost a character in the book." 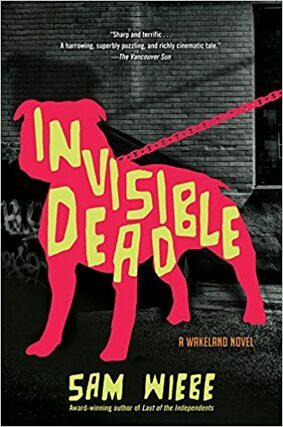 BC Book Look - Maansi Pandya - "Invisible Dead emphasizes the strength and resilience of the human spirit against seemingly insurmountable odds." David Nemeth - "As Los Angeles is to Rockford, Vancouver is just as alive and important for Wakeland. With Invisible Dead, Sam Wiebe delves into our collective fictional past and creates a character with wondrous possibilities." Col's Criminal Library: A "really impressive PI tale."